Uber just banked $3.5 billion from Saudi Arabia's investment fund. The deal marks the company's biggest cash influx from a single investor. With the cash, Uber also added a new member to its board: Public Investment Fund managing director Yasir Al Rumayyan. "We've seen first-hand how this company has improved urban mobility around the world and we're looking forward to being part of that progress," said Al Rumayyan in a statement sent to CNNMoney. He'll join the likes of Arianna Huffington on the board. 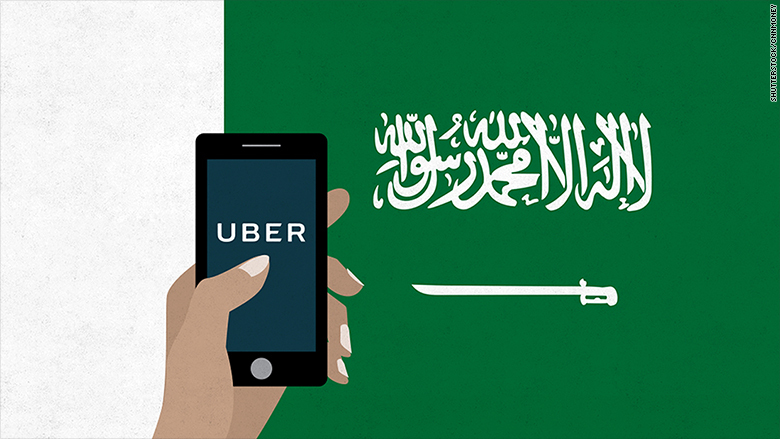 Uber has been operating in Saudi Arabia since 2014. According to Uber, 80% of its customers in Saudi Arabia are women, since women are not allowed to drive themselves. In a statement, Uber CEO Travisk Kalanick called the investment a "vote of confidence" in the company, noting that Uber looks forward to partnering on Saudi Arabia's economic and social reforms. Saudi Arabia's 2030 vision, delivered by Deputy Crown Prince Mohammed bin Salman, aims to reduce the country's dependence on oil, its unemployment rate and its workforce inequality. Uber sees itself as helping the country in that quest. The Middle East marks a big growth area for Uber, which announced in November that it was investing $250 million in the Middle East and North Africa. Uber currently operates in nine countries and 15 cities in the region. Uber said that it now has more than 395,000 riders who actively use its platform in the Middle East, as well as 19,000 drivers. As Uber expands to new markets, it adapts its product to fit the lifestyles of locals. Last year, it rolled out a cash payment option in some markets, including Jeddah and Riyadh, Saudi Arabia. Not to be outdone, Uber's big Chinese rival Didi Chuxing said that its current funding round, which includes a $1 billion investment from Apple, will be bigger than $3.5 billion. Didi President Jean Liu made the comments Wednesday at the Code Conference in California, but the company hasn't yet put a specific number on the fundraising's total. -- Brian Stelter and Sophia Yan contributed to this report.